A south-east view in ink of the Church of St Benedict (or St Bennet) in Lincoln. Originally built by the Saxons, this stone structure is of Norman origin. 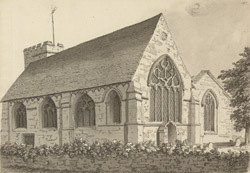 It had been retired as a working church the year before Grimm made this drawing, transferring its parishioners to the nearby St Peter-at-Arches church.